I have been ranchin' at the Ranch House consistently once a month for the past few months. First we went for our wedding anniversary, then to take Cowboy Ron and now to celebrate James and Kate's first of hopefully many trips to Ojai. I was even reviewed by a newspaper reporter a few weeks ago to describe my thoughts on the restaurant. Yay! James and Kate - They were ranchin' at the Ranch House too. 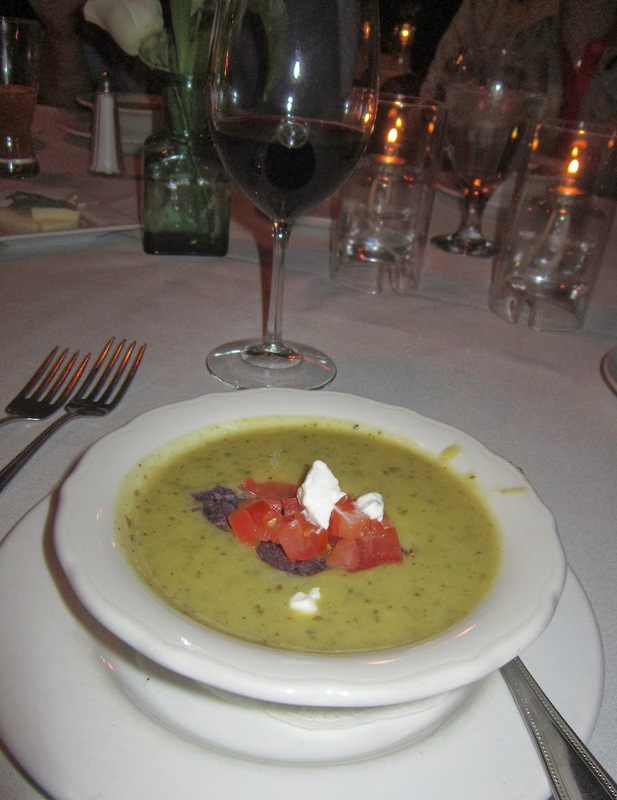 A nice glass of Frog's Leap Cabernet and a bowl of their terrific Chicken Tortilla soup was the beginning to a beautiful meal. In fact, this could have been my entire meal and I would have been perfectly happy. I can't believe I didn't order the scallops. 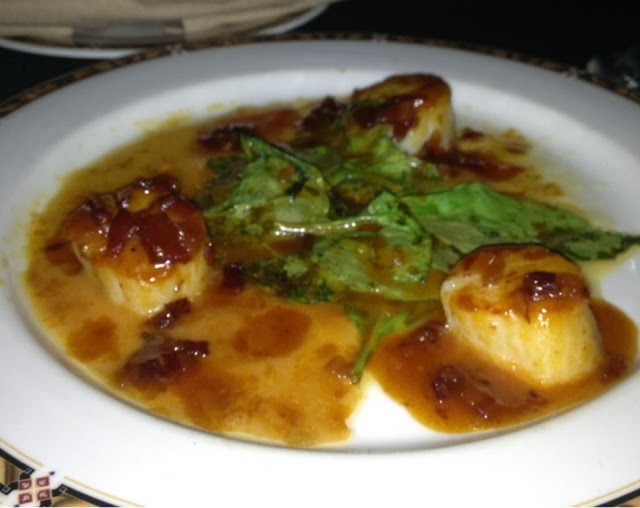 I always order the scallops but that evening I was not as hungry for them as I have been in the past. Maybe because we have been regular diners there and I have worn out my craving, I hope not! I ordered the crab cakes and asked to be served to them as an entree. It was perfect. James and Kate both ordered the chicken and seemed very pleased with their selections. 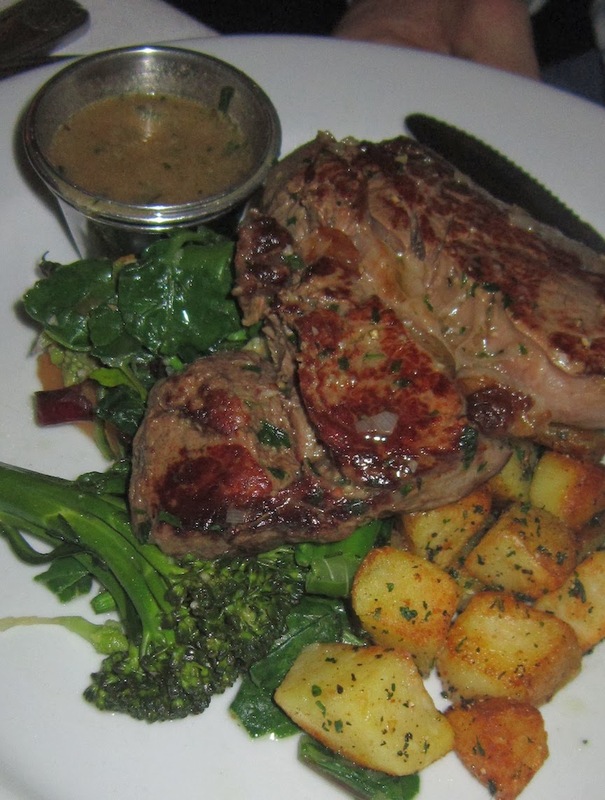 I cannot believe that non of us ranchers didn't order a steak at The Ranch House. How could we?! I wonder if they are going to be excited to see me next month? 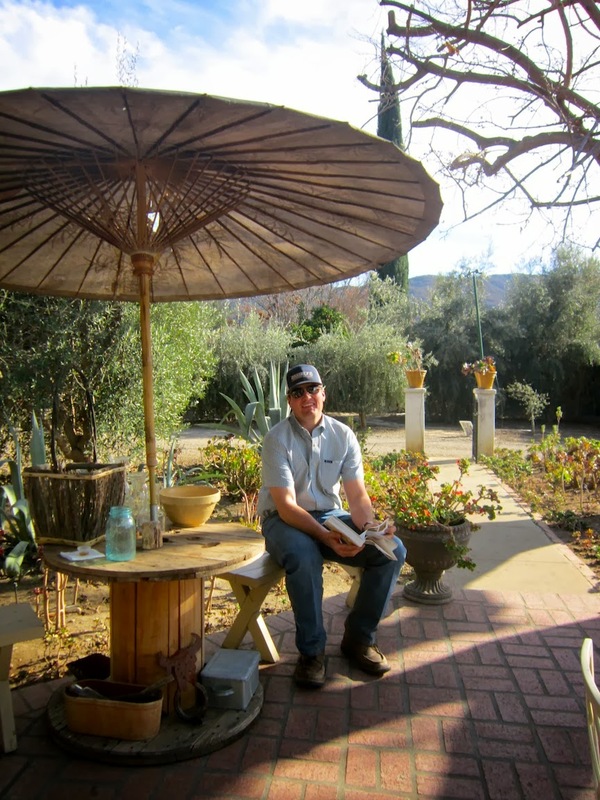 After our lunch in Santa Paula I decided to give James and Kate a little tour of Ojai. We took our photo in front of the Ojai Valley sign, check! Everyone does this. This spot is packed every day of the week! After a scoop of ice cream and a walk through town we saw this sign and turned in. I love a good foodie adventure for Melissa Good Taste. As you can see, the grounds and home were stunning. 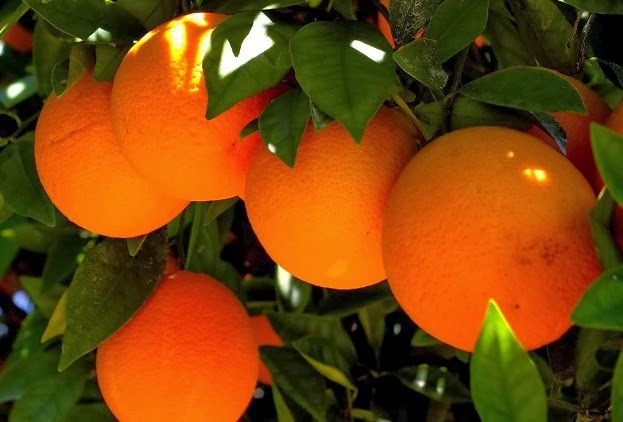 As you drive through the orange tree studded driveway you dead end into their Tasting Room. 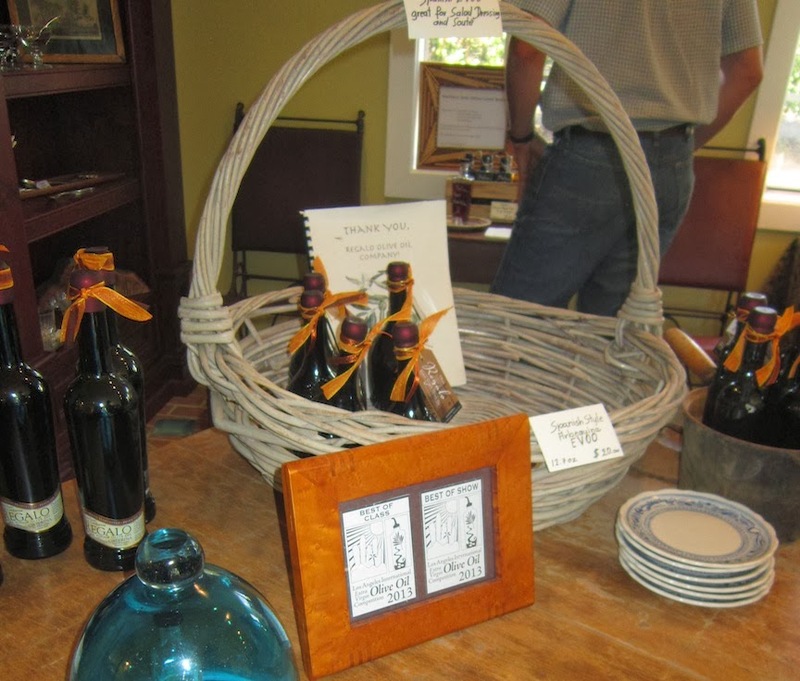 It is filled with all sorts of different olive oils as well as balsamic vinegars. Grab a snippet of bread and start sampling! My favorite flavored oil was lemon. It was drinkable! 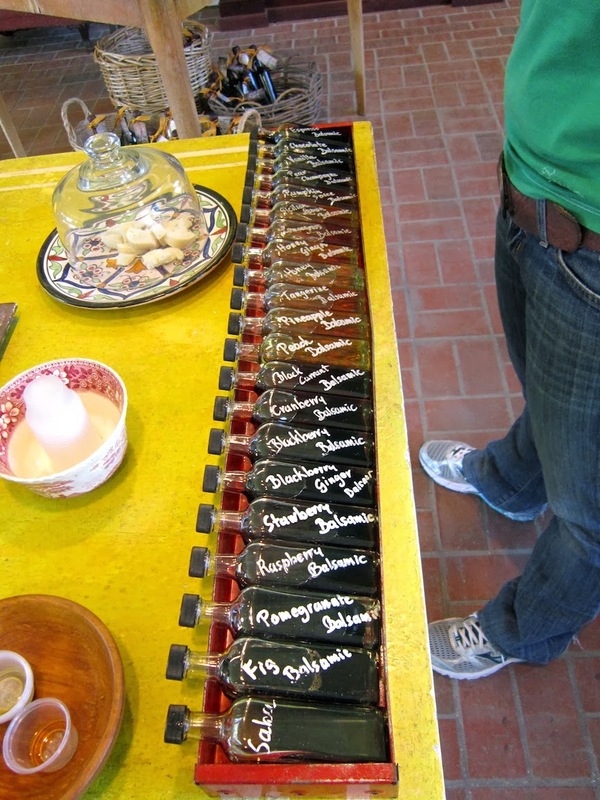 And the strawberry and honey balsamic vinegar's were my favorite. They had chocolate and vanilla too! It was just an enjoyable little activity. James stayed outside but I didn't blame him, it was a beautiful day! Ojai is pretty special, I don't appreciate it on a daily level. I am usually too busy running to the bank, post office or grocery store to stop and smell the orange blossoms. When giving tours of my new home town it usually reminds me of how lucky I am to live here. James, Kate, Scott and I rode all morning and they got lessons on how to cut cattle. I helped out and made the mornings instruction go as smoothly as possible. By noon, we were all hungry and James was craving a chips and salsa so I took them to Familia Diaz - complete with there own salsa bar! Kate claimed they were the best chips she has ever had and the salsa super good! 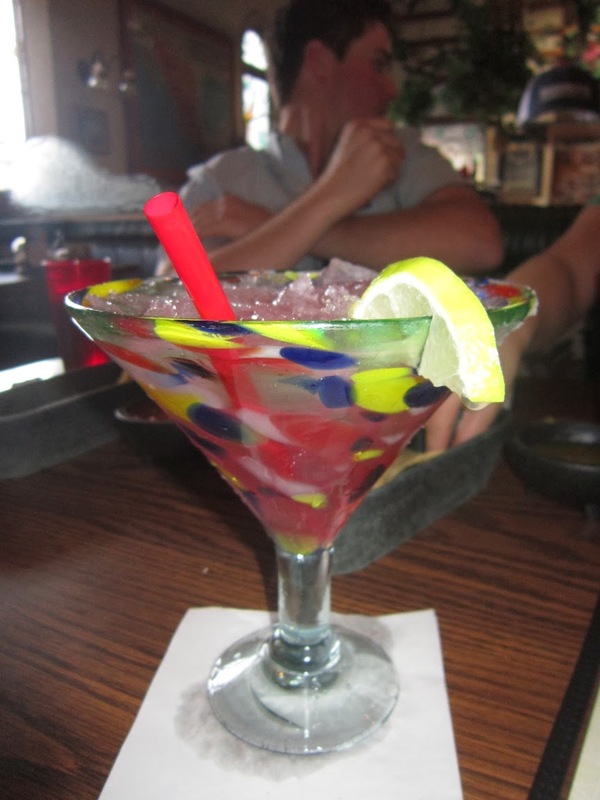 Any trip to Familia Diaz is not complete without the Sunset Margarita. It is the best, they are pink! Scott wanted Bean Dip and he got this mountain of spicy goodness. By the time our food arrived we were stuffed from the chips and dip! 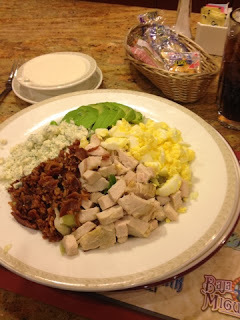 James ordered the carnitas because it was photographed on their menu, he figured they must be pretty proud of it. He seemed to enjoy every bite and ate them like little burritos with tortillas brought to the table. Both Scott and Kate ordered tostadas, which are like mini salads with rice on the side. They too seemed very pleased with their selections. I ordered the Spicy Chili Colorado. It was entirely too much food and I ended up bringing more than half home with me but the sauce is very good. It most definitely spicy and the tender pieces of beef are succulent. 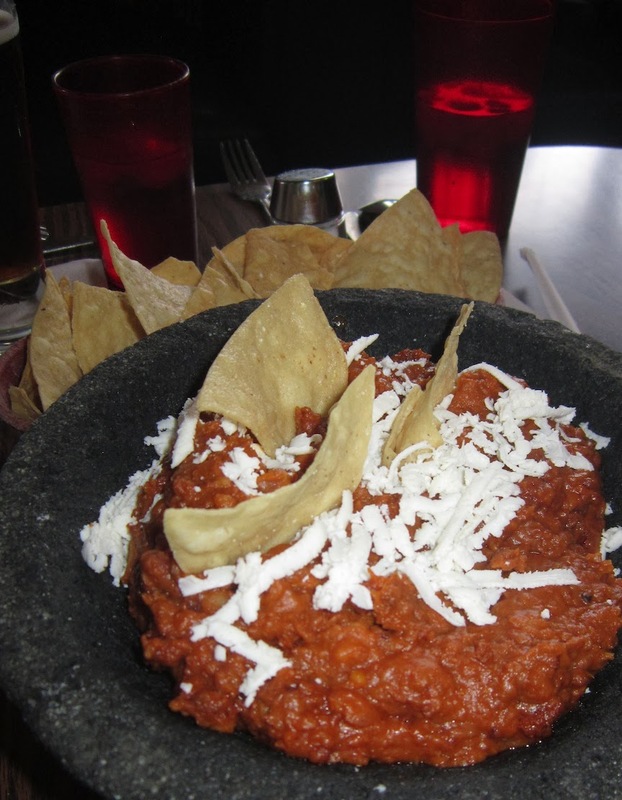 It is a really good place for weekday lunch specials, and Wednesday's they feature half off their margaritas! It is no Dona Esther's but it does the trick here. Scott and I had a whirlwind of a weekend entertaining my brother and his girlfriend, Kate. We had plans to meet them at the bottom of the hill to catch a nice dinner on their way to our house. 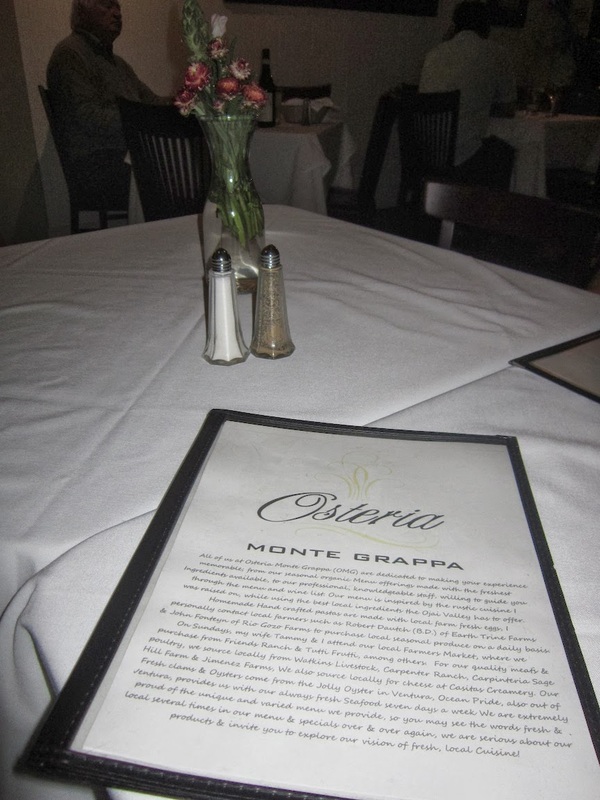 In the arcade of downtown Ojai lies Osteria Monte Grappa, remodeled after a kitchen fire and looking beautiful as ever. Scott and I arrived to the restaurant early to lock down a table so we ordered an appetizer to start. He let me do the picking, knowing full well I would pick the scallops. He doesn't like scallops but knows I love them so he eats them anyway. What a guy! Loaded with cream, walnuts, and caramelized leeks, two scallops are meant to be shared between a couple. What you must do is also eat this dish with slices of bread. Sopping up the balsamic, mixed with bits of creamy and walnuts with each bite. Sinfully delicious. 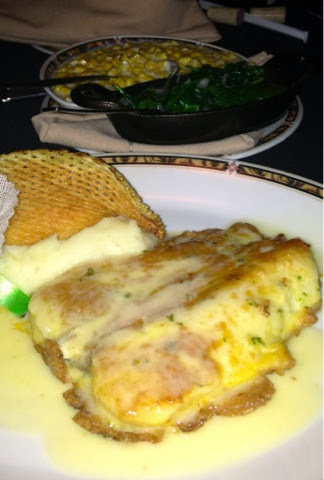 Our guests of honor arrived and we ordered our entrees... Scott's came first and it was the duck Lasagna. I was not shocked to hear him order this. He loves duck and likes to try new things. He liked it, it was a hearty portion. I tried a bite and thought it was ok.
James ordered the steak and said it was very tender and a nice cut. I know all he really wanted to order was Chicken Parmesan so he was a good sport for being so congenial about my choice of restaurant. Next came out my Salmon, as well as well as one for Kate too. However, she ordered the chicken. So they whisked it back to the kitchen and whipped up a chicken breast. It was a little awkward and they did make it right in the end but it was a damper on their first meal in Ojai. As it was the salmon was not so tasty and sliver of polenta cake that they give you in embarrassing in comparison to the cost of the plate. Desserts would make us leave on a happy note right? Oh yes, indeed. Scott ever the gentleman let me order my favorite the Creme Brulee to share and it was a little loose. I did not mind but the loose, eggy combination might have turned Scott off as he only had a bite. James and Kate shared a cup of the house made Dark Chocolate and Hazelnut Ice Creams. They both happily indulged as we savored the time we had together. It is not often I get to see my family anymore so we soaked in every moment. Does everyone Groupon? I had not been taking advantage of the slammin' deals they were offering until a $40 Gropoun came up for $80 worth of food at Enzo's at the Glen Tavern Inn. I had eaten as a solo diner there before and wanted to share that experience with Scott Good Taste. This time a creamy Red Pepper Soup to be exact. It was very much like tomato almost exactly so and that is not a bad thing in my book. It was a very hearty portion and I was getting full noshing on it. I had the waiter put the rest in a container to go. I had it for breakfast the next day. I love a great piece of fish, swimming in sauce, bedded by a creamy risotto and with briny capers frosted on top! This plate is usually what I want to eat all the time. I never get tired of it and always am on the search for who does it better. This was pretty darn good. The sauce is a lemony, white wine sauce and I enjoyed bites of the capers with the risotto. I am not going to lie, I didn't even touch the broccoli. Scott went out of the box and Eggplant Parmesan - He said it was great! It was not something I expected him to order but good for him for trying something completely new. He finished his plate until it was nice and clean. 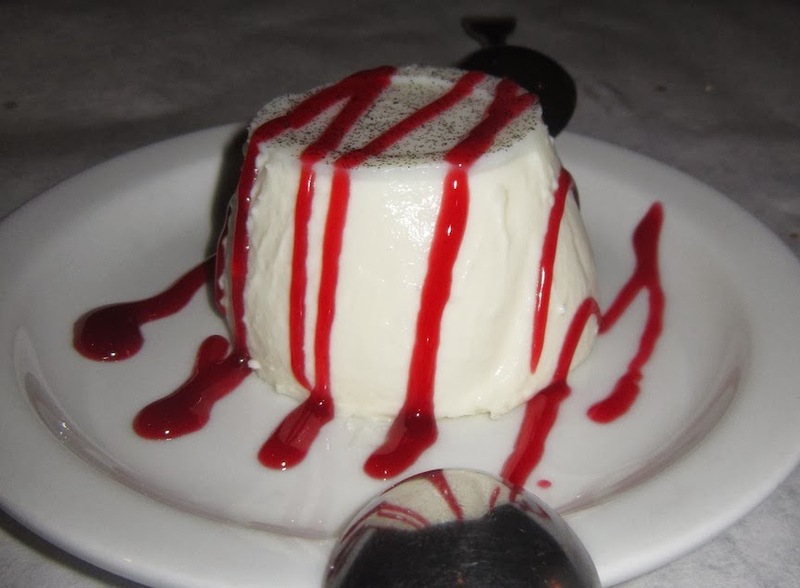 We ended our meal with a panna cotta creme of sorts, vanilla flavoring and topping with a raspberry syrup. It was totally light and exactly what we wanted to end our meal eating. It was pleasant. Do you Groupon? You should! We just had this amazing meal for $40! Cowboy Ron killed it yesterday in the show pen. He won the Non-Pro Derby on his new horse Rubys CD and fourth on Scamper in the 50,000 Amateur. What a lucky guy to have such great horses! 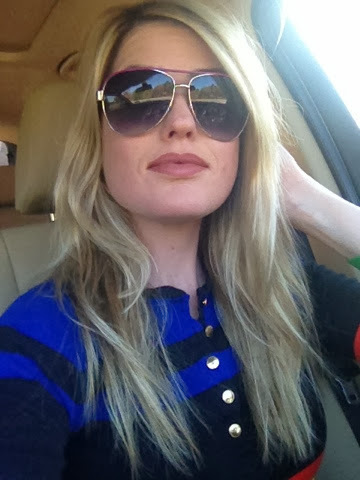 Oh hi, just me with another selfie! It felt nice to be outside in the sunshine! Casino air can get a little dry after awhile. We treated ourselves to a nice meal at the steakhouse after our most successful day. 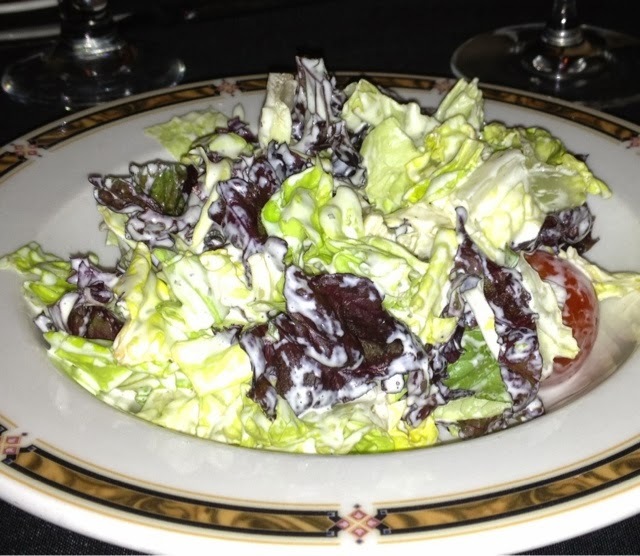 Our meals all started with salads, mine dressed with ranch. 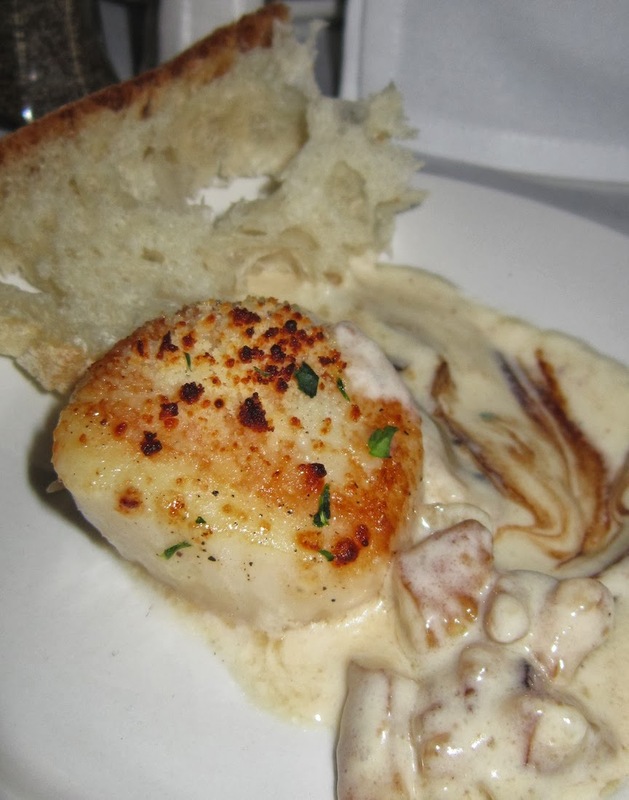 I have always wanted to try the Scallop appetizer and I was sadly disappointed. The sauce it was bathed in was much too sweet and did nothing for the dish. I ordered the Halibut like I have done a million times before. It was ok. There was nothing wrong I was just getting full after I scarfed 3 pieces of the raisin bread from our table's basket. It sometimes weirdos me out how much egg comes on to the plate with the fish, it is breaded with an egg wash. The sauce is always good, buttery and sinful. 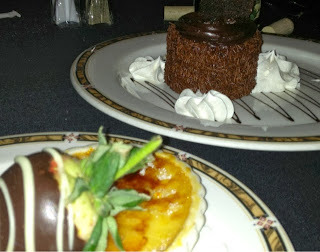 I was extremely full but the boys just insisted on dessert and how could I let them down? One creme brûlée and chocolate cake was brilliant paired with our wine. Stuffed to the gills we waddled up to our rooms and barely made it into our pajamas before we started sawing logs. Melissa Good Taste had another Cowgirl Valentine's Day while we were in Las Vegas. 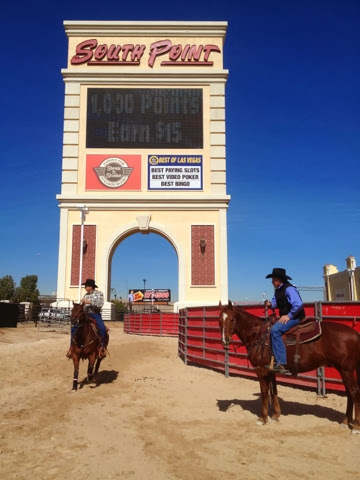 We worked all day doing our horse show thing at the South Point Casino. 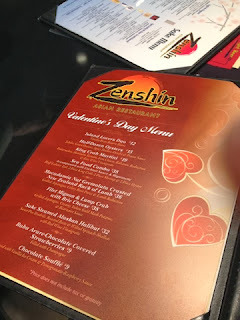 Zenshin is a Japanese restaurant in the casino that had reservations available for Scott, myself and Cowboy Ron. They had a cool Valentine's menu that read very tasty. 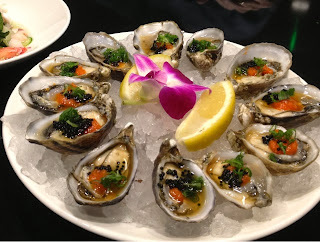 We ordered a dozen kusshi oysters with caviar and fish eggs on top. It was just perfect. A terrific way to start our meal. 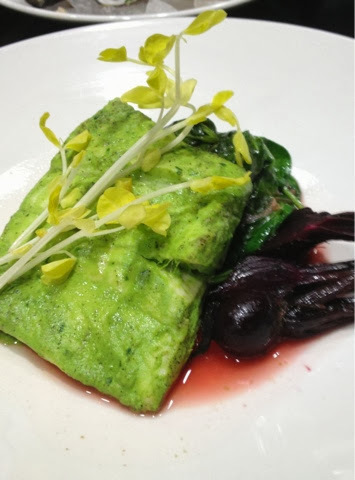 I ordered the Sake Halibut with wilted spinach, roasted beets and pea tendrils. 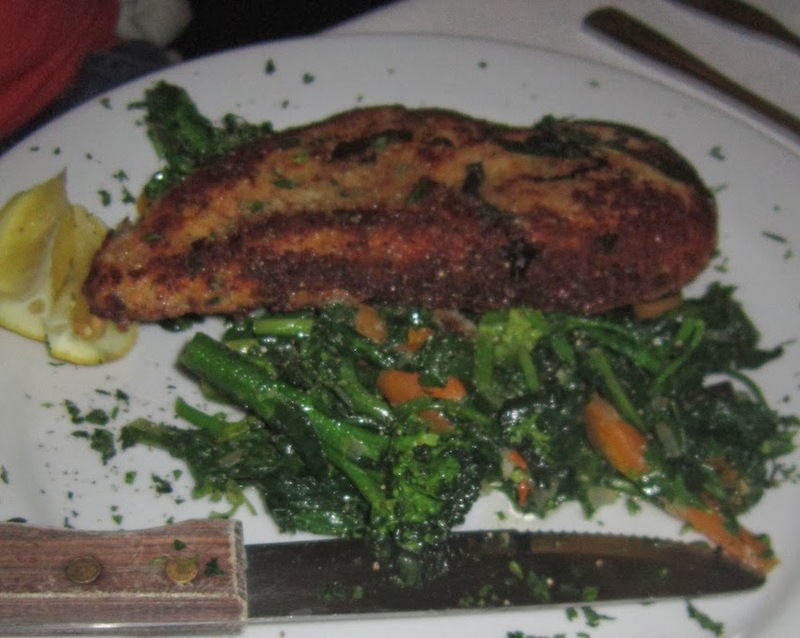 The fish was extremely moist but truly lacked flavor. I wanted a tasty sauce to go with it! The roasted beets were not too tender so eating those were a problem. 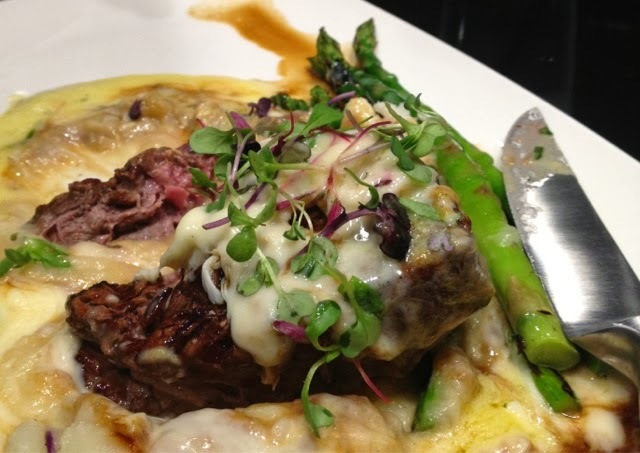 Scott had the Filet Mignon with Lump Crab, Brie Cheese, Mashed Potatoes with Bearnaise. Holy moly, plate of richness! He was in heaven, bite by bite with a smile on his face. We had a fantastic meal and I was lucky enough to have two Valentine's! Thank you Scott and Cowboy Ron!!! 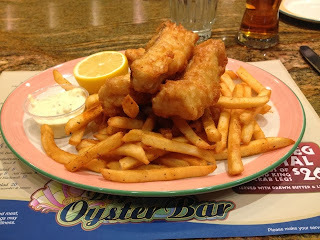 Always the Fish and Chips from the Oyster Bar. They fry them up golden and delicious to order with the batter ever so light. The fries are dusted with a paprika seasoning that makes them virtually impossible to stop eating. 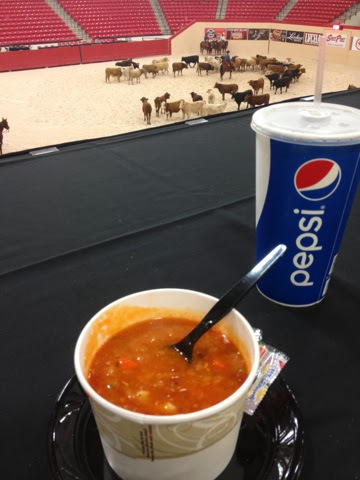 Anyway you shake it, no matter where it what you order - The South Point is an amazing place to get to show your horse! 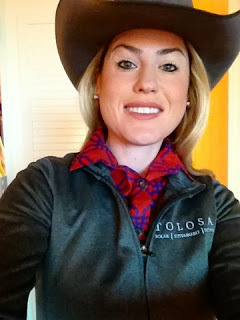 Guess who is on the road again... Melissa Good Taste and her posse loaded up the trailer and made their way to Las Vegas. Yee haw! 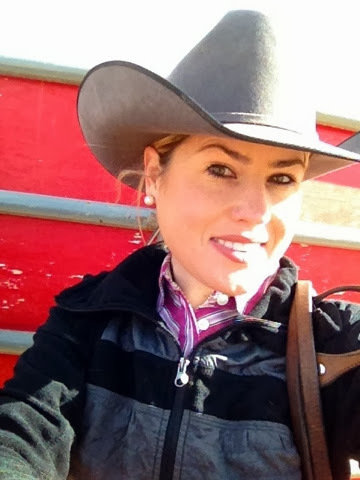 Scott and I did our chores of unloading the tack and horses before heading off for a quick lunch. 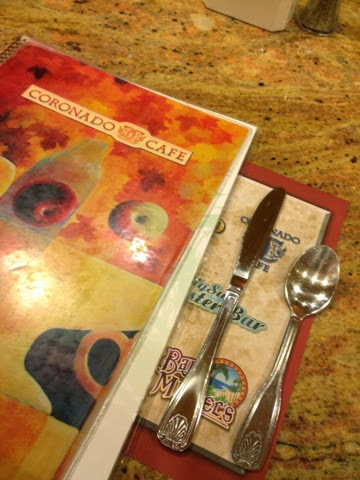 The Coronado Cafe is always an easy pick because it usually busts out quick food. We both wanted to get salads, mostly because we had horses to ride after lunch and didn't want to be too full. I went for the Cobb minus the tomatoes. I hate mealy, flavorless tomatoes so I usually ask for them to be left off when I know they are out of season. It was great otherwise, a total fattening mess but delicious all the same. Scott ordered better and had the Asian Chicken Salad, I love crispy wontons and they had plenty! 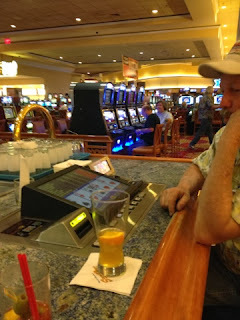 We finished off our evening with a relaxing beverage and a run on the Black Jack machine. We didn't win big in the casino but hopefully we will have better in the cutting pen tomorrow.